Opinion: What to do with Old Houses? Earlier this year, the Los Angeles County Museum of Art (LACMA) installed Metropolis II (2010), Chris Burden’s large kinetic sculpture—it’s a Gordian knot composed of a plastic roadways, toy train tracks, Erector sets, Legos, and blocks. More than a thousand miniature toy cars zip through this model city at 240-scale miles per hour. Three conveyor belts motor the cars into position and then let them fly. As wheels hit the road, the gallery fills with a familiar sound: traffic. The artist, with salt and pepper mop-top and sporting striped oxford, greets the Metropolis II operator, a LACMA conservator in a navy blue pit-stop jumpsuit. Her job is to stand inside the urban contraption and make sure there are no pile-ups or cars careening off the tracks. 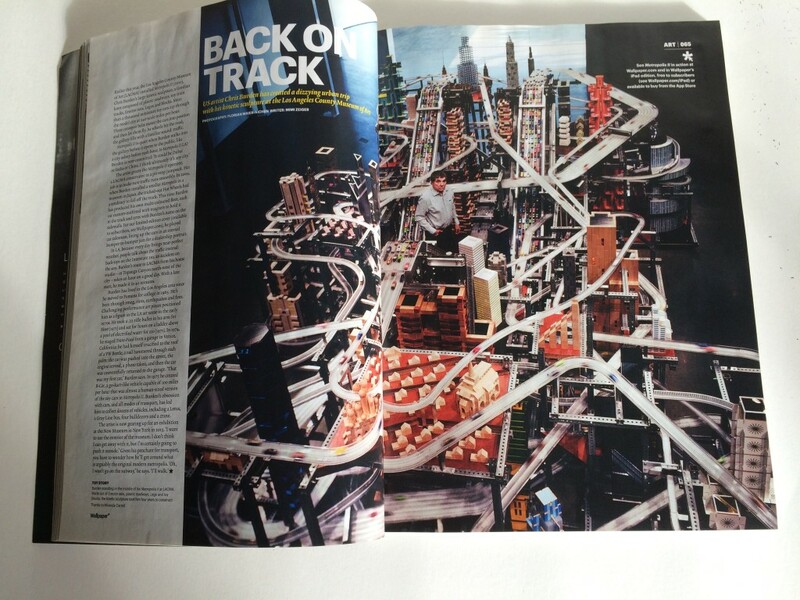 In 2004, when Burden installed a smaller Metropolis in a Japanese museum, the tricked-out Hot Wheels had a tendency to fall off the track. For Metropolis II, Burden produced his own multi-colored fleet (including black and white cop cars). Each custom outfitted with magnets to hold them to the track and tires detailed with Burden’s named spelled out on the side walls. For this month’s cover Burden played car salesman and lined up the vehicles for a dealership portrait. All the little cars are motionless, caught in an eternal bumper-to-bumper jam. Burden’s lived in the Los Angeles area since he moved to Pomona for college in 1965. He’s been through smog, riots, earthquakes, and fires. Challenging performance art pieces that bordered on the edge of disaster positioned Burden as a figure in the Los Angeles art scene in the early 1970s. He took a .22 rifle bullet in his arm for Shoot (1971) and sat for hours on a ladder above a pool of electrified water, 220 (1971). In 1974, he staged another piece of extreme art in a Venice, CA garage. For Trans-Fixed, Burden had himself crucified to the roof of a VW Beetle, complete with a nail hammered through each palm. The car was then pushed into the street, the engine was revved, and then after a photograph was taken, the car was uneventfully returned to the garage. 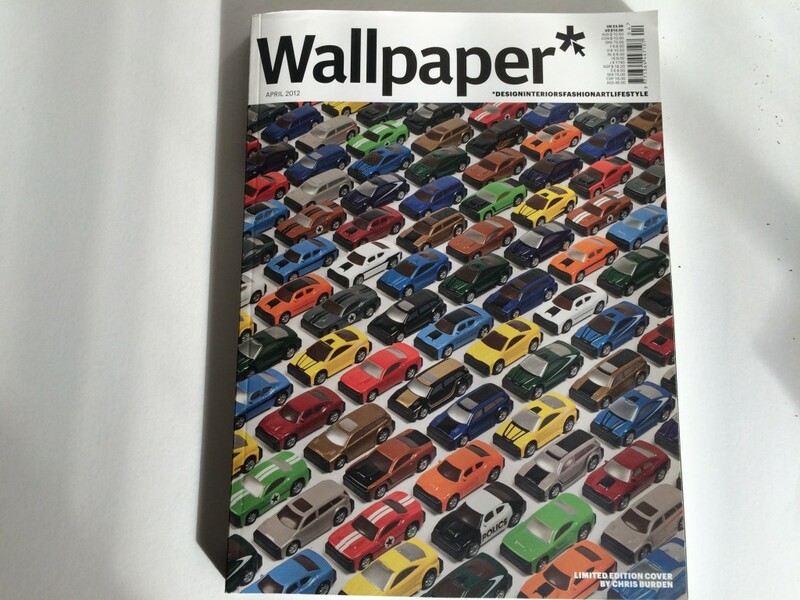 In the mid-Seventies, Artforum ran one of the first cover stories on Burden. In the piece critic Robert Horvitz wrote of Trans-Fixed, “Replacing the cross with a Volkswagen effectively transformed a religious cliché into a diabolically droll, nightmarish masque: Jesus, indeed.” Nearly four decades later, the relationship between his physical, edgy artworks and the crowd-pleasing, child-friendly Metropolis II seems tenuous. Yet for the artist, the connection is there. “That was my first car,” Burden says of his Trans-Fixed co-star. With the success of Metropolis II, Burden is gearing up for a 2013 exhibition at the New Museum in New York City. He’s scheming: “I want to use the exterior of the museum. I don’t think I can get away with it but I’m certainly going to push [the exhibition] to the outside.” Burden even has plans to top the museum with the two mini skyscrapers he designed in 2003.